sunshine, space and vistas…within the stunning Thornton West gated estate, you are surrounded by lush tropical gardens, this villa exudes a stylish, inviting ambiance that says "let the holiday begin!" Thornton Palms is a beautiful, spacious property with stunning views across a colorful tropical landscape. With 4 large bedrooms each with its own ensuite, this villa offers everything you will need including free WIFI, secure parking, fully equipped kitchen and optional Pool Heating. Awake to stunning views across the golf course and enjoy breakfast upstairs to the sound of tropical parrots. Take a short walk to the golden sands of 4 mile beach or a local shuttle into town and enjoy one of many cafe's serving excellent coffee. Go into town for some shopping or lay by the pool catching up on a holiday novel whilst deciding whether to dine in town tonight or maybe at one of the many restaurants or bistros within walking distance. Should you choose to dine at the Villa, cooking in the beautifully appointed kitchen will be easy or for something more casual, try the BBQ next to the outdoor dining area. Located within the stunning Thornton West gated estate, surrounded by lush tropical gardens. Access is gained through a secure port-a-co leading into your private court yard surrounded by tropical gardens. The main house combines two levels. Ground level is for living and relaxing... bi-fold doors open onto the outdoor dining patio and a separate courtyard. A spacious living and dining area includes a sophisticated kitchen, fully equipped for all your requirements. In front of the outdoor patio is a lovely grassed garden leading to the pool where an inviting cabana offers a lounge setting and sun lounges. 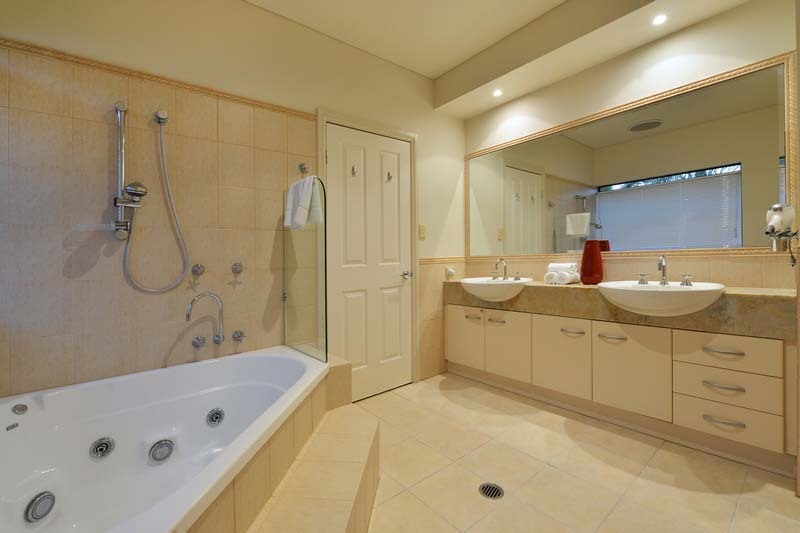 3 bedrooms all with their own bathrooms are spacious and private. Each bedroom has its own flat screen television and all, are beautifully decorated. A balcony with stunning views is accessed by 2 of the upstairs bedrooms. Perfect for an evening cocktail to watch the sun set! The fourth bedroom is separate to the main house... within its own pavilion, a few steps from the front door. It also includes its own bathroom, television and small courtyard. Gardens surround the outdoor living space, framing the stunning golf course and mountain views. Children are also provided for. A Port-a-cot, high chair and stair gate is offered free of charge and a selection of DVD's and board games to keep them amused. Space for everyone with the ground level designed for entertaining, also a sunny pool side area with decking and a shady cabana to escape the sun. 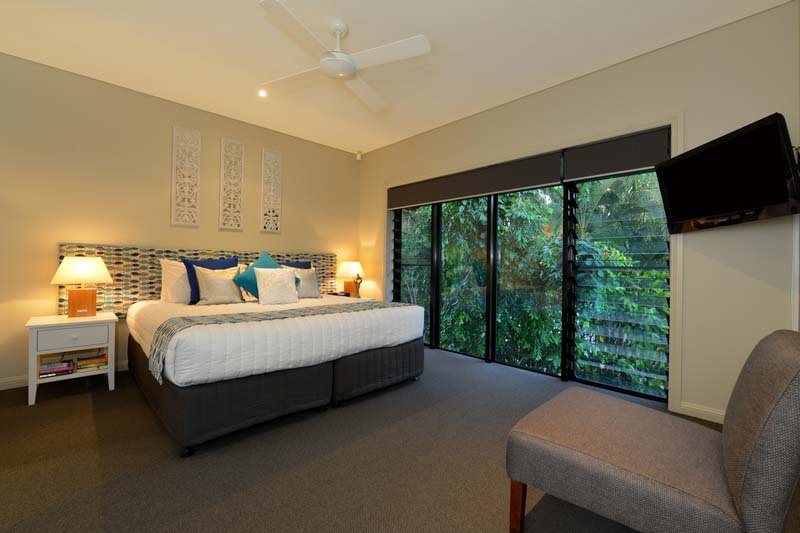 An excellent property for family accommodation in Port Douglas. Large Families and those with babies or small children. 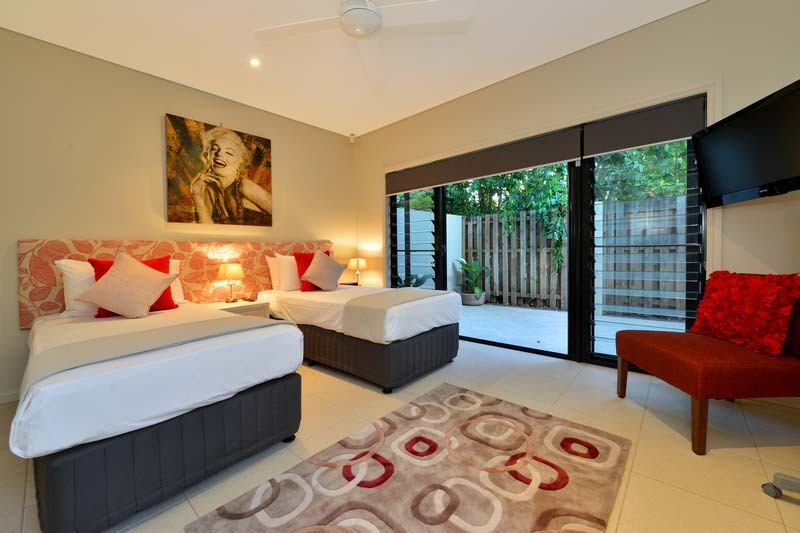 July and September School holiday periods attract a rate of $550 per night. A 5 night minimum stay applies to Thornton Palms. 3 and 4 night stays at a higher rate will be considered on request. Some comments from our Guest Book. "Thank you for an absolutely fantastic holiday. The house was excellently appointed and the pool was relaxing and luxurious. We will be definitely be coming back." 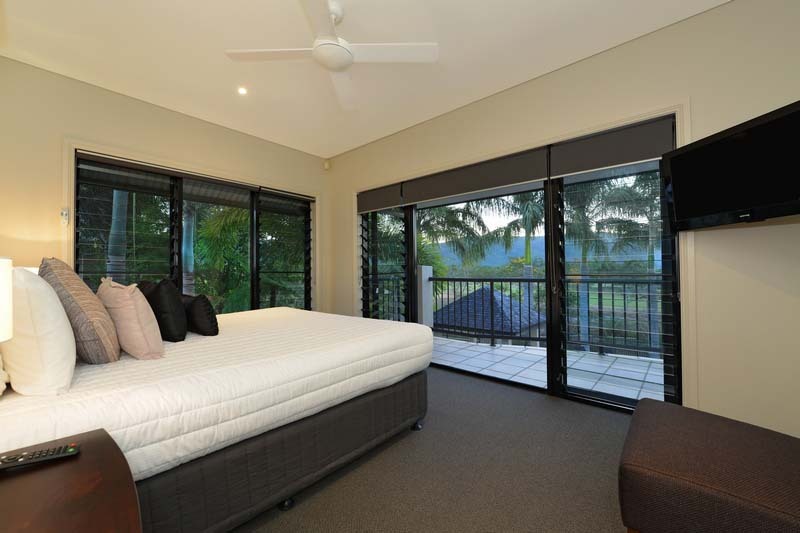 Absolutely beautiful and spacious home in stunning tropical surroundings which provided a wonderful back drop for our relaxing holiday in Port Douglas. Close to the beach and a short drive from the main town centre, it's a great location. Grant was a fantastic host, responding to any questions very quickly and he provided lots of tips of good things to see and do in the area. I would definitely recommend staying here, it's as wonderful as the pictures. Ashley on AIRBNB.